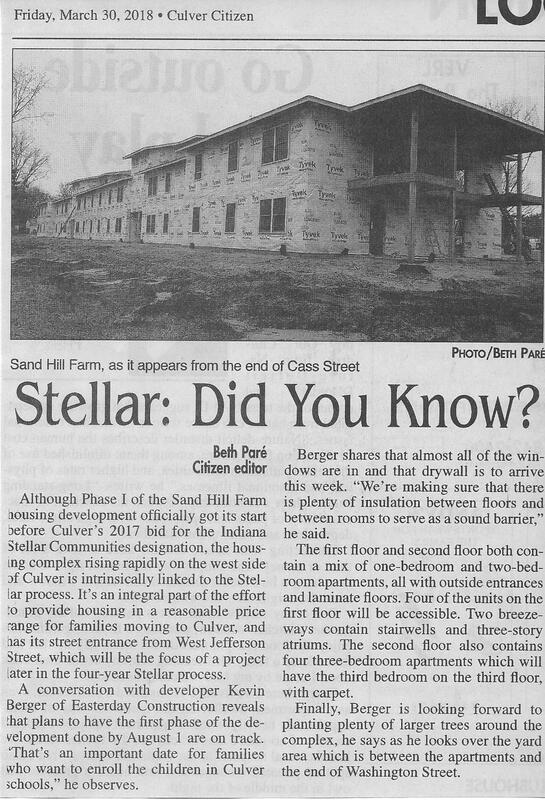 We made the paper this week with our Sand Hill Farm Apartment’s project appearing in the Culver Citizen. Beth Pare and her son came out in the rain for a walk-thru this past Tuesday. Despite the rain there was still a lot of activity at the site. Drywall was being delivered as we spoke. There’s not much doubt that the follow-thru on our Stellar 2016 application pledge of completing workforce housing helped us secure Stellar Community designation in 2017. Preliminary site work had already begun when the Stellar Site Visit occurred. Our successful Stellar designation makes this phase I of workforce housing. Our application for IHCDA funding goes in this July. We will be starting with a market study shortly and will plan for that construction in 2019. Progress has been good this week. All but four windows are in place. Those four have been left out on the second floor until the rest of the drywall is delivered. The drywall will be place on the second floor through those openings using a boom truck. The majority of the exterior doors have been installed. The shingles are on. The interior winding stairs to the second floor bedrooms have been installed. And progress continues on Plumbing and Electrical rough-in. Last week we had meetings with Elkay to discuss the cabinetry that they are providing. They made an additional change to include Elkay sinks in each unit. Thank you Elkay! Easterday Construction is a knowledgeable firm with excellent customer service, and I feel comfortable being able to call on them for any project!